Carmageddon has brought out the resourcefulness of some local agencies, and the inventiveness of some business owners. 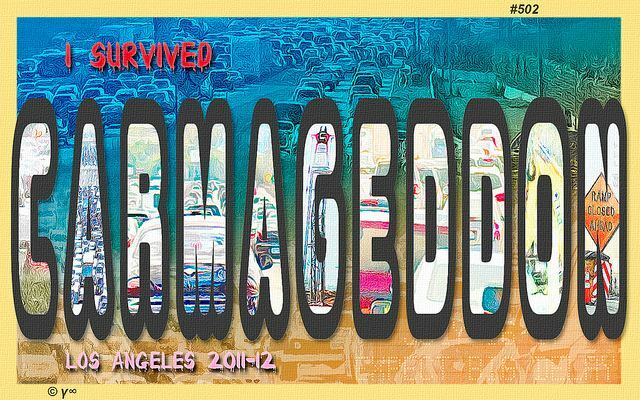 For many, though, "Carmageddon" is simply an overwrought battle cry of the politically beaten-down. Much ado about nothing, if you will. In fact, it is proof that we&apos;ve all turn into pussies. WHY DONT YOU DO AN ARTICLE ABOUT HOW STUPID ALL THIS "CARMAGEDDON" CRAP IS. SEE IF THIS ISNT PROOF ABOUT THE PUSSIFICATION OF AMERICA, ESPECIALLY CALIFORNIA, I DONT KNOW WHAT IS. I LIVE ON THE WEST SIDE AND I DONT CARE, I HAVE TO FIND OTHER WAYS TO AND FROM WORK, BUT I DONT CARE!. THIS IS PROOF POSITIVE ABOUT WHAT WHINNY ASSES CALIFORNIA&apos;S HAVE BECOME. "OH MY GOD THE FREEWAY WILL BE CLOSED FOR 50+ HOURS" I THINK SUICIDE IS THE BEST ANSWWER. CARMAGEDDON JUST THE WORD MAKES THIS OUT TO BE A BIGGER DEAL THAN IT IS. IS THIS THE KIND OF WORLD LIBERAL DEMOCRATES HAE CREATED A SOCIETY THAT VIEWS THE TEMPORARY CLOSER OF A FREWWAY AS "THE END OF THE WORLD". YOU REALLY NEED TO DO AN ARTICLE ON HOW LAZY AND SPOILED PEOPLE ARE HERE.ANYWAY STOP WITH THE "CARMAGEDDON" CRAP THE WORLD IS NOT COMMING TO AN END. Clearly, suicide is not the answer to your "Carmageddon" weekend, and hopefully, in using the common (pretty hilarious) term for the 405 Freeway&apos;s 53-hour shut down this weekend, we&apos;re not so much perpetuating the concept of doom, but rather, well, just using the word everyone is using. Besides, we know that Carmageddon doesn&apos;t love you: It doesn&apos;t care about your audition, your Prius, or your Botox appointment. We do agree with our caps lock-loving Westside reader that the world won&apos;t end this weekend (that&apos;s October 21, remember?) and we can all stand to take public transit or just stay in our own neighborhoods for a couple of days. The pussification theory, though? Hmmm. We&apos;ll leave that up to you to debate.